Can bonds run much further? What is forgotten in this analysis is that the bond market is substantially larger than the stock market. The size of the US bond market is estimated to be between $31T and $34T. By contrast, the total market capitalization of the Wilshire 5000, which encompasses virtually all of the investable stocks in the US, variees in the $13T to $15T range. 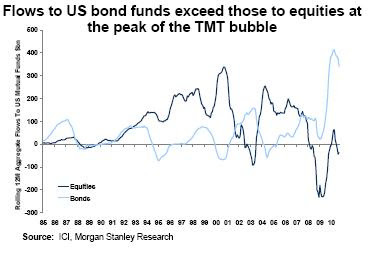 If this is indeed a bond bubble, then based on the disparity between the size of the stock and bond markets and the funds flow data, bond prices have the potential to run much, much further than anyone expects. The was some recent buzz in the blogosphere when Jeffrey Hirsch of the Stock Traders' Alamanac forecast that the Dow would go on an eight-year tear with a target of 38,820 (see the full comment here). Most commentators focused on the maginitude of the gain. Lost in the noise of the forecast was that the start of the bull market would begin in 2017. Jeremy Grantham revisited his “seven lean years” scenario in his July quarterly letter. About a year ago, Art Cashin highlighted the 17.6 year stock market cycle, which pointed to a bottom around 2017. I also wrote about an academic study that correlated demographic trends to P/E ratios, which pointed to a long-term bottom around 2018. I also suggested that while markets are likely to be flat longer term, they are going to be volatile and experience huge intermediate term swings. Now Hirsch has bought a ticket on the 2017 train and that ticket is looking more and more interesting. In that kind of low-return environment, I would reiterate my thesis that buy-and-hold strategies are likely to disappoint, especially in an era of uncertain equity risk premiums. Investors need to look to new strategies to raise their returns. How big is the Pension Time Bomb? Most of my more astute readers already understand that defined benefit pension funds is a time bomb waiting to explode. Now a new study that suggests that we don't even known how big the problem is. The median expected investment return for more than 100 U.S. public pension plans surveyed by the National Association of State Retirement Administrators remains 8%, the same level as in 2001, the association says. The country's 15 biggest public pension systems have an average expected return of 7.8%, and only a handful recently have changed or are reconsidering those return assumptions, according to a survey of those funds by The Wall Street Journal. Corporate pension plans in many cases have been cutting expectations more quickly than public plans, but often they were starting from more-optimistic assumptions. Pension plans at companies in the Standard & Poor's 500 stock index have trimmed expected returns by one-half of a percentage point over the past five years, but their average return assumption is also 8%, according to the Analyst's Accounting Observer, a research firm. To understand how realistic an 8% assumption is. Let's assume a 60% stock/40% bond asset mix. Let's be generous and say that the bond market can return 3%. That comes to a long-term equity return assumption of 11.3%, or an equity risk premium of 8.3%! Sadly, the pension profession never got the memo on that idea. The setting of investment assumptions accepts as a rule that risk margins will be earned without fail. Therefore, when looking at a portfolio of common stocks in a pension trust, the actuary will assume that the equity premium will be earned over the long haul and build that into his discount rate assumptions and earned rate assumptions. In other words, if an actuary is told that the equity risk premium is 8.3%. He will build it into his models and assume, come hell or high water, that stocks will earn 8.3% over bonds over the long run. So far, this is all old hat for those who have been following the pension fund time bomb story. As interest rates have fallen, the net present value of pension liabilities rise, but return assumptions have fallen enough and a big yawning pension gap is the result. Moreover, the historical experience shows that an equity risk premium of 8.3% is, shall we say, a tad high. Investors have to be offered risk premiums to invest in risky assets. These risk premiums take different forms in different asset markets: equity risk premiums (ERP) in stock markets, default spreads in bond markets and real asset premiums in other asset markets. These premiums have their roots in fundamentals and will vary as a function of uncertainty about the economy, the risk aversion of investors, information uncertainty and fear of catastrophe, among other factors. In practice, analysts in developed markets have generally looked backwards to estimate risk premiums, using historical data to arrive at their estimates. Implicitly, they assume that historical averages are not only precise but also that risk premiums are stable and revert back quickly to historical norms. In this paper, we present evidence that risk premiums in equity, bond and real asset markets are not only imprecise, but are also unstable and linked across markets. We present estimation approaches that are more in line with dynamic, shifting risk premiums. We argue that the resulting estimates can help use make more informed asset allocation and asset valuation judgments in portfolio management and better investment, financing and dividend decisions in corporate finance. For newbies, let me explain the importance of this paper. Millions of business school and actuarial students have been taught Modern Portfolio Theory, or MPT. It is an investment theory that tries to maximize expected return for a given level of risk by carefully choosing the proportions of various assets in a portfolio. Harry Markowitz, who earned a Nobel Prize in Economics for the theory, modern portfolio theory introduced the idea of diversification as a tool to lower the risk of the entire portfolio without giving up high returns. Using MPT depends on knowing, or estimating, two numbers for each asset class – risk and return. In practice, most investors estimate returns for stocks using an equity risk premium using the following procedure: Historically, stocks have returned X% over bonds. Bond yields are currently Y%, therefore we can expect a return of X + Y for stocks. The Damodaran paper calls that estimation procedure into serious question. He concluded that historical data studies indicate that estimates of asset class risk premiums don't really mean revert to long-term averages and they are unstable in the short and long run. If an investor doesn’t have a good estimate for equity returns, then how can he build a portfolio? Damodaran suggests that investors should look to market based indicators. Consider the bond default spread as a signal of equity risk appetite and realized vs. estimated risk as another indicator, e.g. realized vs. implied volatility embedded in equity option markets around the world. How high the pension deficits? In the past year alone, we have seen studies indicating $1T deficits in public pension plans and other similar stories of pending disaster. Are US public plans "only" facing a $1T deficit? Given the results indicated by the Damodaran paper, the scary part is we don't even know. As NBER has declared the recession over and with the SPX decisively rallied through technical resistance at 1130, traders should be tilting towards the bullish side, right? Not necessarily. Barry Ritholz posted on the 10 things that make him nervous about the market. I generally agree with Barry's assesssments and I would like to add a few more of my own. While I don't have ten items, here is what is bothering me about stocks at the current levels. The chart looks like an inverted saucer to me - which is bearish. The cyclicals deteriorated through a relative uptrend in May and are now in a relative downtrend. This is not the picture of a robust economic recovery. What's more, when I look at housing, as proxied by XHB against the market, it isn't signalling a rip roaring recovery either. As well, the Banking Index looks terrible against the market. This picture looks a lot like the relative chart of the cyclicals - a relative downtrend within an inverted saucer top formation. Without leadership from the Financials, can a new upleg be launched? For the followers of my Inflation-Deflation Timer model, I refer to my latest comment indicating that I am getting very mixed signals. The model has moved to a technical "inflation" signal. I would tend to discount that signal and remain in "neutral" because of the anomolous condition of strong commodity prices and falling bond yields. As I've emphasized in recent weeks, the U.S. economy is still in a normal "lag window" between deterioration in leading measures of economic activity and (probable) deterioration in coincident measures. Though the lags are sometimes variable, as we saw in 1974 and 2008, normal lags would suggest an abrupt softening in the September ISM report (due in the beginning of October), with new claims for unemployment softening beginning somewhere around mid-October. It's possible that the historically tight relationships that we've reviewed iin recent weeks will not hold in this particular instance, but we have no reasonable basis to expect that. Indeed, if we look at the drivers of economic growth outside of the now fading impact of government stimulus spending, we continue to observe little intrinsic activity. IMF Managing Director Dominique Strauss-Kahn has warned about a jobless recovery. The New York Times reports that older Americans are worrying that they will be permanently locked out of employment. Even if that isn't true, these concerns will serve to put a lid on their spending. Polls show that unemployment is rising again. At a local level, Gregor Macdonald reports that California employment is falling again. Should we depend on a Bernanke Put? To be sure, the latest FOMC statement seem to indicate that the Fed stands ready to act with another round of quantitative easing should the economy show signs of further weakness - and that should put a floor on any stock market decline. In the interim, however, the bulls may have to suffer through a growth scare before the Fed rides to the rescue. Could China be ahead of the curve on Basel III? In the wake of the announcement of the Basel III standards, there have been numerous calls that the standards are too relaxed (see comments here, here, here and here). Bank lending is concentrated on local government financing vehicles, the infrastructure sector and big corporations. With the speeding up of structural economic adjustments, there is clearly a rising possibility of loan losses. The quality of loans to the property industry is currently still sound. But we need to be on high alert as to the impact of property price fluctuations on such loans. The NPL ratio of credit card loans is rising rapidly and the potential risks demand attention. By the end of 2009, bad credit card loans reached 7.8 billion yuan, up from 3.5 billion yuan a year earlier. The NPL ratio of such loans stood at 2.8 percent. Banks should continue to support exporters to help a recovery in exports and support domestic firms venturing abroad. Banks need to increase recapitalisation efforts and replenish their core capital base via retained earnings and fresh injections of capital from shareholders. China will restrain the blind expansion of banks by implementing stricter capital requirements in line with the Basel Accord. China will open up the banking sector in a timely manner and actively attract foreign financial firms that will help the country to better serve small businesses and agriculture and to boost domestic consumption. If official government policy is that the banking system is to support "a recovery in exports and support domestic firms venturing abroad" and the banking system is fragile, then something must be done to ensure that banks don't drag the system down. There was also a Bloomberg story that China may impose a 15% capital ratio for the biggest banks. Is China ahead of the curve on this? As the gold price moves to all-time highs, it's useful to revisit the debate over the usefulness of a gold standard. 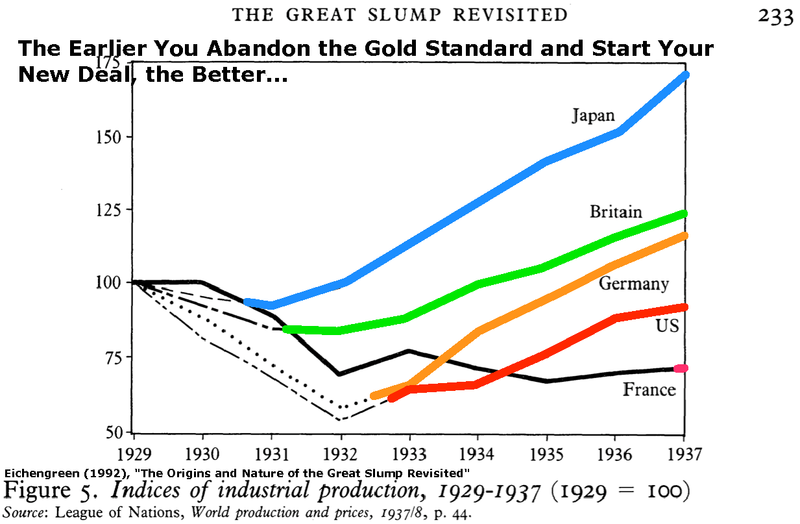 The gold standard was a key factor behind the Great Depression, but why did it produce such an intense worldwide deflation and associated economic contraction? While the tightening of U.S. monetary policy in 1928 is often blamed for having initiated the downturn, France increased its share of world gold reserves from 7 percent to 27 percent between 1927 and 1932 and effectively sterilized most of this accumulation. This “gold hoarding” created an artificial shortage of reserves and put other countries under enormous deflationary pressure. Counterfactual simulations indicate that world prices would have increased slightly between 1929 and 1933, instead of declining calamitously, if the historical relationship between world gold reserves and world prices had continued. The results indicate that France was somewhat more to blame than the United States for the worldwide deflation of 1929-33. The deflation could have been avoided if central banks had simply maintained their 1928 cover ratios. 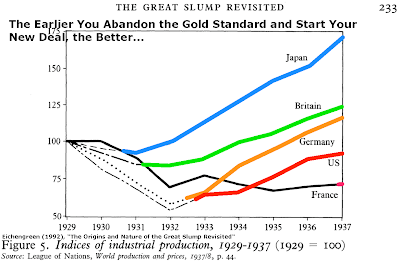 Brad DeLong also put up a chart showing that the French were the last to emerge out of the Great Depression. Was it because of their stubborn embrace of the gold standard? In Peter Bernstein's important work entitled The Power of Gold, which discusses the history of gold and the story of other commodity backed currencies , the author appears to be relatively agnostic over the issue of the value of a gold standard. “Fiat money has no place to go but gold,” the former Fed chairman said at the Council, according to economist David Malpass, who quotes Mr. Greenspan in one of Mr. Malpass’ emails on the political economy. Mr. Malpass writes that the former chairman of the Federal Reserve’s board of governors was responding to a question in respect of why gold was hitting new highs. Market sentinel and canary in the coal mine? Yes. A gold standard for currencies? No. It's too inflexibile and creates too much economic volatility. This has been a frustrating few months for both bulls and bears. The market has been mired in a trading range since June with an upside of 1100-1130 and downside of 1020-1040 with little directional bias. As the stock market rallies into technial resistance in the 1100-1130 zone yet again, the question has to be asked, "Will it get rejected once more in this resistance area?" The odds seem to favor another downleg for a couple of reasons. First of all, investor sentiment has gotten incredibly bullish in the space of a couple of weeks, which is contrarian bearish. As I've noted frequently in recent commentaries, the typical lag between deterioration in say, the ECRI Weekly Leading Index and the ISM Purchasing Managers Index is about 13 weeks, and sometimes longer. The typical lag with respect to new claims for unemployment is about 23-26 weeks (which puts the likely window of deterioration at about the October - November time frame), and the typical lag with respect to the payroll unemployment report is, not surprisingly, about 4 weeks beyond that. The current situation reminds me of mid 2007. Investors then were content to stick their heads into very deep sand and ignore the fact that The Great Unwind had clearly begun. But in August and September 2007, even though the wheels were clearly falling off the global economy, the S&P still managed to rally 15%! The recent reaction to data suggests the market is in a similar deluded state of mind. Yet again, equity investors refuse to accept they are now locked in a Vulcan death grip and are about to fall unconscious. Given the sentiment backdrop, where readings improved from investors being ultra-bearish two weeks ago to very bullish today, the market is not likely to advance significantly from current levels. I believe that the more important test will come when it descends once again to the 1020-1040 level. Will sentiment swing once again to widespread fears of a double-dip slowdown or will there be sufficient complacency for it to fall through that important support level? Will economic data weaken to suggest a higher probability of a slowdown to warrant further de-risking? Last week the World Economic Forum reported that the US has fallen from second to fourth in its competitiveness rankings. It lost its top spot last year to Switzerland. This year, it had been overtaken by Singapore and (socialist!) Sweden. In many of these surveys, the scores of the top countries are all clustered together so small movements in rankings aren’t terribly meaningful. However, for the US to slip from first in one year and then to fourth the following year is a disturbing trend. The report said a lack of macroeconomic stability continues to be America's greatest area of weakness, with repeated fiscal deficits leading to burgeoning public indebtedness. It also said that U.S. business leaders show less trust in politicians and the government's ability to maintain an arm's-length relationship with the private sector. I believe that America’s ills stems from neglect, largely from the short-term nature of American thinking. There has been a neglect of infrastructure, a lack of focus on basics of innovation and wealth creation, as well as an erosion of the advantages bestowed by education. The most recent infrastructure report card gives American physical infrastructure badly failing grades: Aviation (D), Bridges (C), Dams (D), Drinking Water (D-), Energy (D+), Hazardous Waste (D), Inland Waterways (D-), Levees (D-), Public Parks and Recreation (C-), Rail (C-), Roads (D-), Schools (D), Solid Waste (C+), Transit (D), and Wastewater (D-). Fixing this shortfall requires spending of over $2T. Nevertheless, there are calls for greater infrastructure spending as a way to build an economic recovery. These higher skills have become commodities, said Catherine L. Mann, a global finance professor at the Brandeis University International Business School who studies the outsourcing of jobs. The programming language “C++ is now an international language,” she said. “If that’s all you know, then you’re competing with people in India or China who will do the work for less.” In addition to lower wages, developing countries offer significant consumer growth, giving businesses a reason to make more products closer to the buyer, and hire locally. And increasingly, these new, lower-cost research centers, while perhaps initially intended to adapt products for local use, are becoming sources of innovation themselves. But since 1980, and especially since 1990, the world has become more open. If the American capitalists want to make more money, they still have to invest in new technology, and they still need an increasingly educated workforce. But now, because of globalization, they can get that workforce anywhere in the world. You can think of this as arbitrage: China doesn’t have that many college graduates as a proportion of its population, but they come cheaper than American college grads. Or you can think of it as free riding: if China (or Korea, or India, or Brazil, or anywhere else) is willing for whatever reason to invest in increasing the number of domestic college graduates, the American capitalists can simply expand their operations over there and save themselves the trouble and expense of investing in the American educational system. (And for China, the returns on investment in education might be higher than the returns for America, because the marginal productivity of new investments in education is probably higher.) And as a result, average educational attainment only went up by 0.8 years from 1980 to 2005. Perhaps the next big engine of growth will not come from Silicon Valley, but from another sector. Mike Mandel believes that the US has made a big bet on life sciences, in the form of the human genome project, but it hasn’t paid off. In addition, other countries have exploited the competitive disadvantage of American restrictions on stem cell research to catch up and overtake US research in this field. I don’t have the answers to America’s ills. I can see two paths, both equally likely.The first path leads us to Greece (see this excellent Vanity Fair article on Greek culture and the crisis), where people have turned inward and milk institutions (governments, foreign entities such as the IMF, EU and ECB) for everything they can get away with, while public institutions wither. As it turned out, what the Greeks wanted to do, once the lights went out and they were alone in the dark with a pile of borrowed money, was turn their government into a piñata stuffed with fantastic sums and give as many citizens as possible a whack at it. In just the past decade the wage bill of the Greek public sector has doubled, in real terms—and that number doesn’t take into account the bribes collected by public officials. What they wanted to do with money in the dark varied. Americans wanted to own homes far larger than they could afford, and to allow the strong to exploit the weak. Icelanders wanted to stop fishing and become investment bankers, and to allow their alpha males to reveal a theretofore suppressed megalomania. The Germans wanted to be even more German; the Irish wanted to stop being Irish. All these different societies were touched by the same event, but each responded to it in its own peculiar way. Will Time heal our wounds? The honest answer – but one that few voters want to hear – is that there is no magic bullet. It took more than a decade to dig today’s hole, and climbing out of it will take a while, too. As Carmen Reinhart and I warned in our 2009 book on the 800-year history of financial crises (with the ironic title “This Time is Different”), slow, protracted recovery with sustained high unemployment is the norm in the aftermath of a deep financial crisis. [T]here is a fairness issue. By some measures, nearly half of all Americans do not pay any income tax already, so cutting taxes skews an already very unequal income distribution. Deferred maintenance on income equality is one of many imbalances that built up in the US economy during the pre-crisis boom. If allowed to fester, the political consequences could be severe, including trade protectionism and perhaps even social unrest. Are "Black Swans" not so black anymore? John Hempton at Bronte Capital recently blogged about the puzzling condition of rising gold prices and falling bond yields. Indeed, we have seen rising commodity prices in the form of the CRB Index (pictured below) and the CRB Raw Materials Index, which is largely composed of nom-traded raw materials, is only 3% from its all-time highs. Normally, bond yields rise as inflationary expectations rise. But instead of rising yields, we have seen falling bond yields – which is typically associated with deflationary episodes instead of rising inflationary expectations. I interpret these conditions as Mr. Market being worried about both inflation and deflation. Moreover, when we see stories like Titan Capital Joins Black Swan's Taleb in Raising Bets on Crash, it seems to me that Mr. Market is also worried about rising tail risk, i.e. extreme events. This may be an indication that tail risk is becoming a crowded trade. Is this a time to sell tail risk volatility? A lot of long-term analysis seems to be converging towards the launch of a new secular stock bull in the 2017-2018 timeframe. Jeremy Grantham revisited his “seven lean years” scenario in his July quarterly letter July. About a year ago, Art Cashin highlighted the 17.6 year stock market cycle, which pointed to a bottom around 2017. I also wrote about an academic study that correlated demographic trends to P/E ratios, which pointed to a long-term bottom around 2018. I also suggested that while markets are likely to be flat longer term, they are going to be volatile and experience huge intermediate term swings. At best, this scenario means nearly a decade of flat returns. In this case, standard buy-and-hold asset allocations will disappoint investors with their low returns and high volatility. I have long maintained that even within a structural bear market, there are huge returns to be made in equities from participating in short-lived cyclical rallies like the one we have just seen. The Nikkei regularly used to enjoy 40-50% rallies as policy stimulus drove pronounced cyclical upturns in both GDP and profits. My preferred investment approach, which I wrote about in the Qwest Investment Management’s September 2010 newsletter, is to embrace the volatility and use dynamic asset allocation techniques to trade the intermediate swings in the market. I would like to try something different for a change this Labor Day long weekend. In these pages I have been an advocate of examining assumptions so that a modeler can understand the weaknesses of his models. With that thought in mind, here are a thought experiment that I would like to conduct. Bear in mind that there are no right or wrong answers, only better answers about yourself and your world views. Economists generally like free markets as they are efficient allocators of resources. But what happens when free market principles collide with social mores? Walter Herrera, quality control and risk manager for the Chilean mining company GeoTech, has said his company was bringing a specialized device typically used for boring water holes to the mine. The drill would use one of the three bore holes already made as a pilot and widen the diameter to about 28 inches, which officials have said is wide enough for the miners to be hoisted through. Mining is a dangerous profession and the miners knew the risks. Certainly they would have been paid a risk premium for dangerous work and someone with rational expectations would have bought insurance to prepare for such an event. Drilling down half a mile through solid rock using specialized equipment can’t be cheap. Given the costs involved, do they deserve to be rescued? If the answer to the previous question is “yes”, then who should pay for the rescue? If the company pay, has it done a cost benefit analysis of paying compensation of no rescue vs. the cost of a rescue? (Does the company bear any legal liability in this case given the miners knew that they knowingly took risky jobs?) If the government pays, doesn’t that just socialize the costs, just like the banking bailouts? Should the miners themselves pay? After all, they should have known that mining is a risky job and therefore demanded a risk premium in their wages. If that was the case, why would they not have hedged (bought insurance) against such an eventuality? In the tradition of Hayek and Friedman, they were free to choose their own risk profiles. If you find these questions objectionable, then how do you react to a hypothetical case of an American without health insurance who is diagnosed with cancer? Should the patient be asked to pay for his or her care? What if the cancer is not immediately life threatening and care was not mandated? Is your answer any different from your previous answers about the Chilean miners? What about these issues raised by Brad Delong on the segmentation effects of genetic testing on the life insurance business? We can identify with the Horatio Alger story of the self-made man. Free market principles are about creative destruction: aallowing people to succeed (and allowing failure). What are the effects when someone wins or loses the genetic lottery without any action on their own? Isn't the practice of genetic screening just the free market at work? Back in the days of the Soviet Union, there were endless essays about the "purism" of various schools of Marxist thought. This has been a self-test of the purity of adherence to free market thoughts. Remember, there are no right or wrong answers, just insights about yourself and your assumptions about the world. Since my post, the Australian market has beaten the Canadian market by about 8%. The maximum outperformance of this trade was about 11%. The pair trade has reached parity. It's time to take profits.